Tutor Time's Two's program, whom we like to call Twaddlers, is active, sensory based and meaningful. Our specially designed program provides lots of guidance for the independence that this age group needs and desires. A research-based developmental program developed specifically for our Infants, Toddlers and Two's. Unlike other programs, Learn from the Start focuses on key developmental milestones rather than chronological age. In doing so, unique experiences and lessons are designed around your child's needs and emerging skills. Each individual and small group experience will stimulate and expose learning concepts in a fun and engaging way. Your child's teacher will be using specifically designed materials to teach, observe and record your child's learning. Teachers will choose weekly activities that build on emerging skills and introduce new concepts. Our daily routine allows time for small group and individual experiences. Your child will work on those developing social skills when she works with her classmates to create a giant block structure. She will also have an opportunity to engage her creative side with art and sensory materials. Teachers will help children build upon early literacy and communication skills by sharing books, singing songs and engaging finger plays. 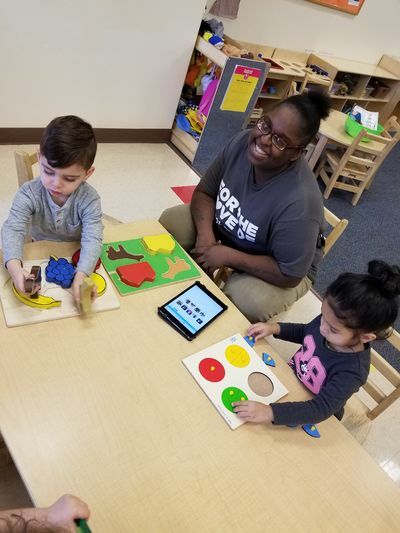 Whether it's listening to the sounds of the ocean or mixing the colors of the rainbow, our teachers give our Two's plenty of opportunities to investigate, explore and play in a safe, secure, yet stimulating environment. Our unique blend of education and care meets emotional needs while promoting good social skills and learning. And the exclusive Tutor Time® LifeSmart™ curriculum is designed to nurture all the different ways that children can be smart - from building an architectural masterpiece to creating an interpretive dance. "Ms Deja is very enthusiastic to bring joy and happiness to her little Two's. She is very conscientiousness of their schedule and routines throughout the day." 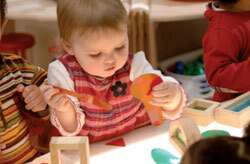 " Ms Emily encourages an engaging environment for her busy little Two's. Always cheerful and ready for the day!." "Ms Brittani is very dedicated to her little Two's. She is very experienced with this age group and brings a sense of calm throughout the day." "Ms Rafiun makes each child in her classroom feel special. Rafiun is very warm and considerate of all the children in the classroom." "Ms Natalie's happy disposition creates a warm, inviting environment for a very busy Two's classroom."